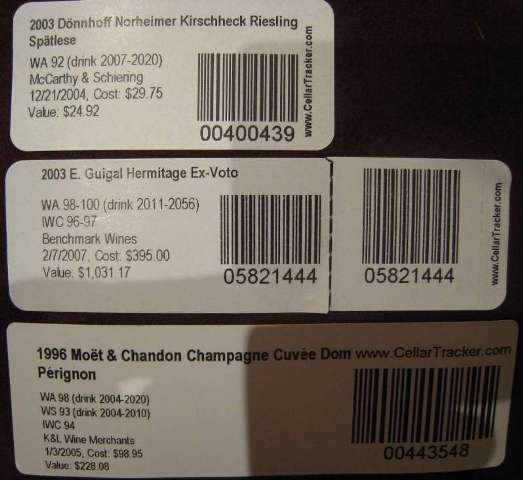 CellarTracker supports several different label sizes, which are described below. To change the label size, simply select the corresponding option from the Label template drop-down on the barcode printing dialog. The default symbology used for CellarTracker barcodes is Interleaved 2-of-5, although we now support QR codes for the 30336/11352 template size. Non-US DYMO users: Please note that non-US DYMO printers require labels with black squares on the back in order to function properly. You'll need to find appropriate labels for your market which contain the markings. If you're not able to find the exact size as below, you can always customize the templates to match what is available as described in this help topic. This is the default size. The equivalent label for Europe is 11352 ("Large Return Address Labels", SKU number S0722520). This label size can also be used to print QR codes; simply select the QR Code: 30336 / 11352 option from the label template drop-down. 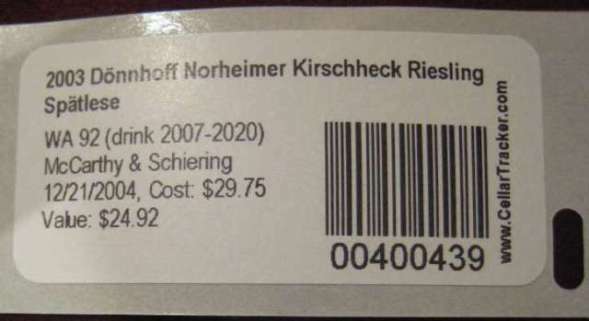 Sample DYMO 30336 per-bottle label. Sample DYMO 30336 per-bottle label with a QR Code. Marc Lazar of CellarAdvisors has been working with dozens of clients since early 2005 to get them all inventoried and barcoded on CellarTracker. Based on feedback from some clients, they came up with the idea for a specially perforated label (with a more lightly glued portion), and I worked with him to add a 'removable' barcode to fit these labels. That way you can easily tear off and save a copy of the barcode for later scanning and removal. These work with all DYMO LabelWriter series printers, including 300, 330, 400, 450, Duo and Twin Turbo models. NOTE: The original ("OLD") version of these labels used a non-standard size of 1" x 3-3/8", but as of July, 2010 these have moved to a standard DYMO size. The "NEW" labels have yellow glue on the back of the tear-off tab. You need to choose the correct label size in your label settings. We have heard a handful of reports of these labels not working well with non-US DYMO printers, so buyer beware if you are using a DYMO printer outside of the US. Please also see the automated troubleshooter if you are still having issues.